I often get asked by people who have missed The Hunger Games craze what makes all the teenage girls go wild over it. Most people just know the movie/book as the one about all the kids killing each other. And how could that possibly be appealing to teenage girls? And I say that there is one vital ingredient: a love triangle. You see, The Hunger Games is rich with ideas. There are kids killing each other because the government thinks that it is okay to punish the peasants for being peasants. The higher power like to think they are walking cupcakes. Any moment there could be an uprising. But no, lets not obsess over all these problems. Lets not even acknowledge them. Because, in amongst all of the futuristic political turmoil, the only thing on the teenaged minds is the obviously really important love triangle between our heroine, Katniss, the man shes thrusted into the competition with, Peeta, and her buddy from District 12, Gale. I personally didnt have a problem with the love triangle in the books. It is kinda sad how Katniss has to pretend to be in love with Peeta so she can survive, but her true love lies with Gale. But the love triangle is so horribly done in the movie...and yet, little teenage fangirls who havent picked up the book have got their armour and picked their side. If we were just going by the movie, why are we even picking? Katniss clearly does not need a man. Of course being in a battleground where everyone is waiting for you to die isnt going to make you fall in love with anyone. There are obviously bigger things on your mind...like, I dont know, surviving? Peeta is kinda boring in the movie, and sure, his frosting skills may be clever, but Im not sure the way to my heart is by disguising yourself as a rock. And then theres Gale, who pops up every now and again so that the audiences can go "awwwwwww" (this actually happened). You just dont pick who you want to team up with by looking at their rock disguise skills or the fact that they make you go "awwwwwww" for three seconds. And yet, theres people out there who are willing to marry Peeta or Gale. Sure, they may have read the rest of the series and have gained enough material to back them up, but at the heart of it all, theres a girl who has bigger things on her mind. Katniss is what makes The Hunger Games. Not the love triangle. Since Twilight came around (well, it has probably been a lot longer than that, but I cant remember teenagers ever being so vociferous), teenage girls have been programmed to get on teams. The teams in mind are Team Edward - the vampire - and Team Jacob - the werewolf. Never mind that the person were supposedly choosing for is Bella Swan, who is extremely boring, extremely clumsy and extremely...I dont know...morose? Of course, the picking and choosing isnt based on personalities - mainly because no-one in the love triangle seems to have one - but it is based on looks. And boy, to teenagers get rowdy about those looks. Unlike The Hunger Games, theres not a whole lot of extra meaning in Twilight, but then again, I couldnt tell you whats so romantic about a guy who watches you sleep for months on end, or the other guy who is just plain creepy. What Twilight has done, though, is changed the face of teen entertainment forever. I wasnt the biggest fan of Harry Potter, but that had people obsessing over trying their own spells and thinking they could run into walls at train stations (I kid...but if you did that Im totally not judging you). Now, well never have a teen movie that doesnt obsess over love triangles more than anything else. Unless they make a movie about my life so far. What is your opinion on the state of teenage fandom? 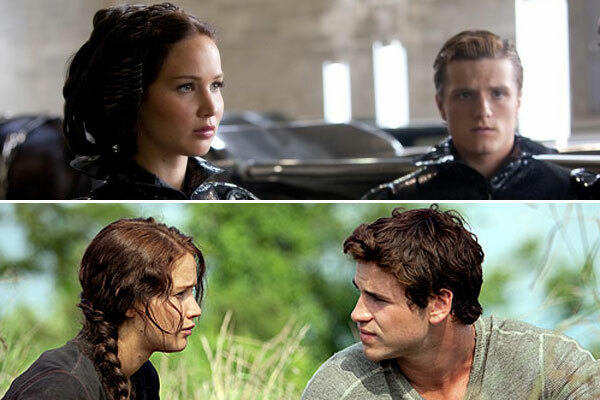 How did you think the love triangle was handled in The Hunger Games?